During late summer and early fall, the fine meshed, 1-2 meters in diameter, large golden webs of the golden silk spider (Latin: Nephila Clavipes) make a sticky trap for unwary insects. The spider (pictured below) is well known to people from Florida and other southern parts of North America. Recently a 6 inch long (15 cm) golden silk spider was found on the front porch of a house in Ohio. 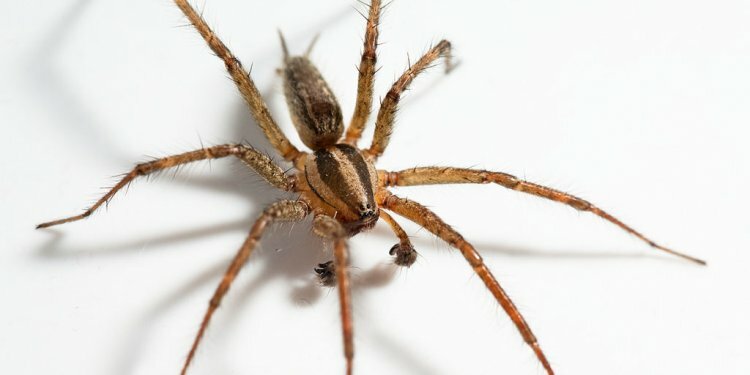 The owners of the house had been on vacation in South Carolina, which explains why the golden silk spider was found in Ohio, where it normally is not found. The yellow abdomen has given the spider the pet name banana spider. Females of the golden silk spiders are among the largest orb-weavers in the United States. Females normally range from 24 mm to 40 mm in length, but even larger specimens, like the one found in Ohio, have been observed. The female has a white-looking (silvery) carapace and orange spots on its cylindrical body. The silvery carapace protects them against overheating. The males are much smaller, with an average size of 6 mm in length. Both sexes have feathery tufts on their brown and orange banded legs. The yellow abdomen and the silvery carapace make the golden silk spider easy to identify. A golden web spider builds it web in open woods or edges of the forest. The web is usually attached to trees and low shrubs. A bite from the golden silk spider will only produce localized pain around the site of the wound, and the bite is much less severe than a bee sting. Anyway, it's quite an interesting spider even though it isn't as venomous as many other spiders from North America.